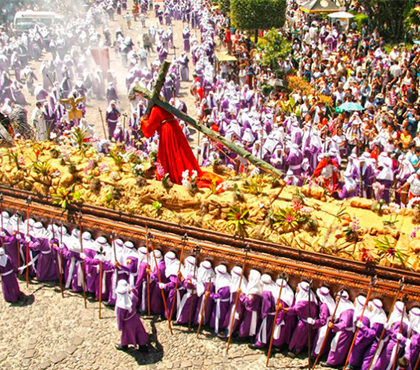 Semana Santa ” Easter Week” in Antigua Guatemala is an event worthy of seeing; it is a grandiose hommage to Jesus’ image and its ‘via-crusis’ that is reflected in the ‘procesiones‘ (processions) with images made artistically by Guatemalan artisans. It is also part of this tradition, the creation of the beautiful carpets (Alfombras) made with flowers of all kind and colored sawdust that adorn the different streets of Antigua Guatemala, all this it is a work of art. Holy Week in Antigua Guatemala is a reflection of the religious fervor brought behind from Spain five hundred years ago. During Holy Week, Antigua Guatemala hosts the most beautiful religious celebration in the America, when huge processions wind their way through the town’s streets. Actually, the celebration begins on Ash Wednesday, the first day of Lent, and reaches its climax on Good Friday, when Antigua streets are thronged with processions and reverent spectator. The processions consist of big floats, or ‘andas’, bearing statues of Christ with a cross, that are carried by hundreds of purple-robed men. A float with the Virgin Mary Follows by women dressed in black clothing. The processions move slowly through. Antigua cobblestone streets, the feet of the bearers cushioned in the sawdust carpets, which are destroyed as the procession passes over. Visit Antigua during Holy Week, and lent means an extraordinary spiritual rewarding experience which you will never forget. Antigua Guatemala is famous for its spectacular and elaborate religious festivities during Easter Week (Holy Week – Semana Santa). But let’s not forget the Carpets tradition (Alfombras de Acerrin), national and international visitor’s crowd streets not just to see the processions, but also to participate in the detailed elaboration of these colorful carpets to adorn the processional route. The Holy week in Antigua Guatemala is famous for its Catholic celebration, which commemorates the Passion, Crucifixion and Resurrection of Jesus Christ. The entire city participates in the vent, and receives thousands of national and international visitors. Holy Week takes place sometime between March 22nd and April 23rd, and the entire week is full f solemn activities. In Guatemala, processions (procesiones) in the 334 municipalities of the country take place during the Holy Week and Lent. 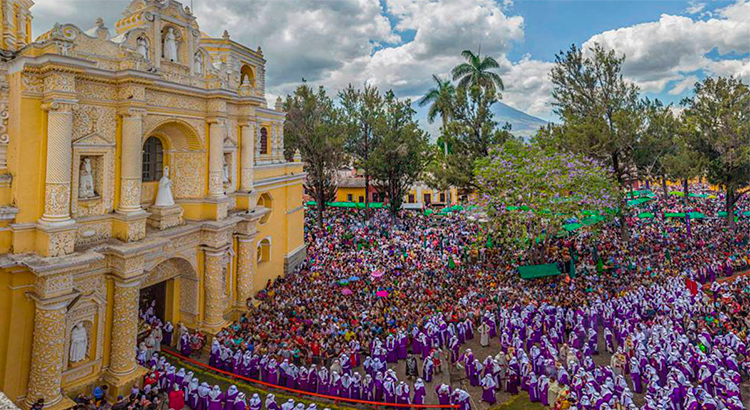 The three cities that are notable for their celebration of Easter week or Holy Week are Antigua Guatemala, Guatemala City and Quetzaltenango. 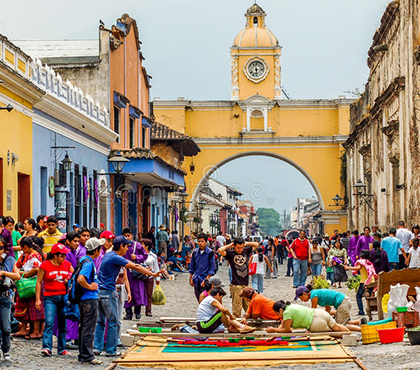 During Easter Week in Antigua Guatemala happens the biggest religious celebration in the region, when huge processions wind their way through the town’s streets. In Antigua Guatemala, this week is expected not only by the tourist but also by the Restaurants in Antigua Guatemala and Stores and Shopping places that oppen their doors to the tourists. The most relevant activities during this time are religious activities like processions, carpets (alfombras), and vigils (vigilias). Everybody adorn the streets with Easter week carpets using colored sawdust, flowers, fruit, flowers, vegetables and other materials making spectacular designs for the procession to pass over. The processions are of a religious theme depicting the last days of Christ. Before Holy Week in Antigua Guatemala, during the Lent, there is a period for preparation for the Passion Week, where you can assist to vigils every Friday with its respective procession on Sunday in some villages and municipalities: first Lent Friday and first Lent Sunday, in Santa Catalina Bobadilla; second Friday and Sunday of Lent, in Santa Ines del Monte Pulciano; third Friday and Sunday of Lent, in Jocotenango; fourth Friday and Sunday of Lent, in Santa Ana; fifth Friday and Sunday of Lent, in San Bartolomé Becerra. Gómez also invites you to the activities for the Semana de Dolores, the week before Easter. You can attend to the vigils of the Virgin of the most important churches in Antigua Guatemala: La Merced, San Francisco, and Escuela de Cristo, and Friday of Dolores, the famous procession of Jesús El Desamparado, just for kids. 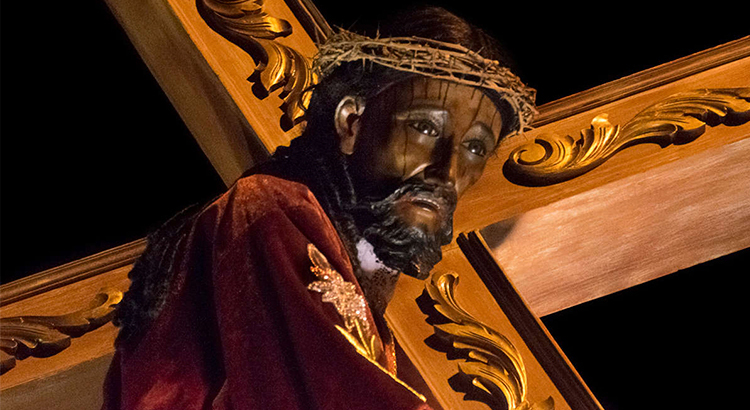 The processions consist of big floats, or andas, bearing statues of Christ with a cross, that are carried by hundreds of purple-robed men, commonly called Cucuruchos. According to Gómez, the processions and vigils of the most important churches in the city are Palm Sunday (Domingo de Ramos); the procession of the History of the Church La Merced; on Holy Monday, the Vigil of Jesús Nazareno de la Merced; on Holy Tuesday, Vigil of Jesús del Perdón de San Francisco el Grande; on Holy Wednesday, Vigil of Jesús Sepultado de la Escuela de Cristo; on Holy Thursday, procession of Jesús del perdón; on Holy Friday, in the morning the procession of Jesús Nazareno de la Merced, and in the afternoon the procession of El santo entierro del santuario de la aldea de San Felipe de Jesús and El Santo entierro of the church Escuela de Cristo; on Holy Saturday, in the afternoon, procession of Virgin of the Village of San Felipe de Jesús, and the procession of La Escuela de Cristo Church; and Resurrection Sunday Procession of Jesús Resucitado of the Church Obras Sociales del Santo Hermano Pedro. Besides the processions, there is also another relevant activity in Holy Week in Antigua Guatemala. This place is famous for its spectacular carpets tradition (alfombras de Acerrin). The visitors enjoy walking on the streets of Antigua Guatemala not only to see the processions, but also to participate in the detailed elaboration of these colorful carpets to adorn the processional route. Guillermo Montiel, member of a family that has been making carpets for Holy Week in Antigua Guatemala for more than 40 years, says that this is a tradition of years that comes from the Colonial era and the religious culture that the missionaries of that time, somehow created what we try to keep today living through these traditions. 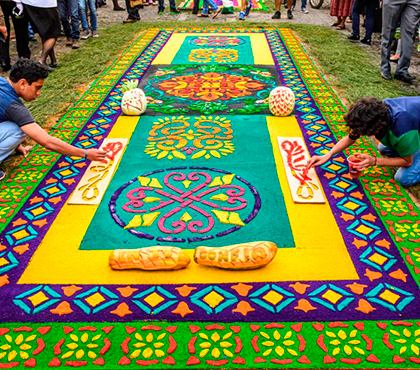 There are two types of carpets that are made during Easter Week in Antigua Guatemala: The carpets along the processional route, made by residents who invite friends and family to assist them, and the carpets in the churches that are made for the holy vigils by the brotherhoods. Montiel, that has approximately 48 years of making carpets in Antigua Guatemala, explains us that first of all, they made cardboard molds of creative figures to use when making the carpets, made of sawdust, sand, lime, and other materials, depending on the design of the carpet. Sawdust is then collected and dyed in different colors. Favorite colors are purple, green, blue, red, yellow and black. Flowers such as bougainvillea, chrysanthemums, carnations, roses and other native plants and pine needles are also used. 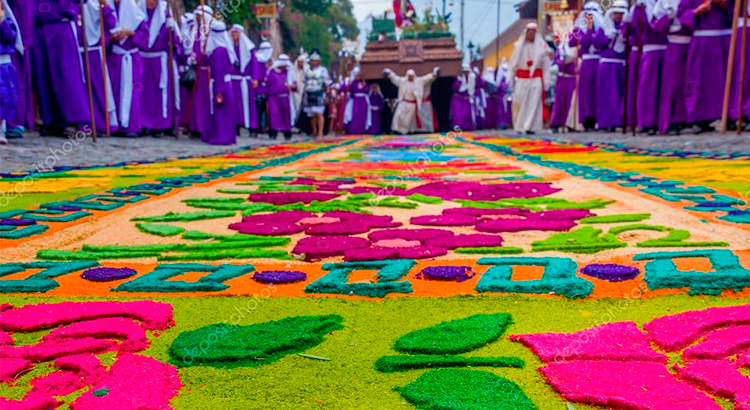 “One of my favorites Easter week processions in Antigua Guatemala is the procession of La Merced, for Good Friday, because all the members of the Montiel family, cousins, uncles, brothers, sons… help in organizing and making the carpet. This Departs at 9pm on Thursday and returns Friday at 8 am. It takes to walk the streets all night, and is one of the main processions that walk in one of the longest carpet, that measures 20 meters. This carpet attracts many tourists”, adds Montiel. 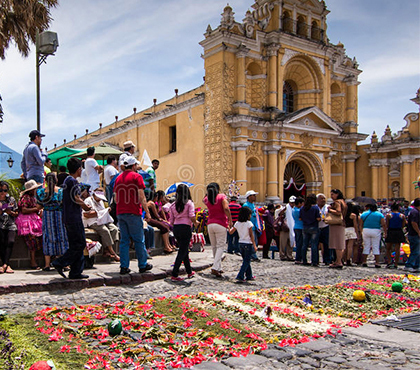 On Good Friday the streets of Antigua Guatemala are covered with natural, aromatic carpets of flowers, pines, clover and fruits, which the residents put together and place in front of their homes. There are all kinds and shapes. Some are very long, even up to a kilometer, with colonial, Mayan, Roman or other original designs, and are made during the 24 hours prior to the procession. If more than one procession goes down a street a new carpet is made for each procession. Preparations for the carpets begin weeks, sometimes months, ahead. Carpets are started the day before the procession so that the carpets are finished just before the carriers of the float arrive to look its best. Carlos Roca, Ex President of La Hermandad de Jesús Nazareno del Perdón, of San Francisco, says that another activity during Holy Week in Antigua Guatemala is the vigils (velaciones) that are held in the churches that have religious activities during the holiday: “One of the traditions in Antigua for Holy Week is the presence of Jesus in the tabernacle in all the churches so that people can visit Jesus at any time”, adds. As you could see, Holy Week in Antigua Guatemala is a colorful week, a lot of traditional folklore, gastronomy of the time, a big economic movement, a lot of spiritual and religious movement. Gómez, of Antigua’s Municipality, agrees and comments that in these days, La Antigua Guatemala offers the visitors what they need, what they want: “Everybody is satisfied with what they see and experience, everyone finds their own niche and this is why, every year more and more tourists visit Antigua Guatemala for Holy Week. I believe that these religious practices are also an element that helps tourists get an idea of our traditions, which are shown with the majestic processions and carpets that decorates Antigua’s streets. On Friday of Dolores: Vía crusis of Silence, leaving from the Church of San Francisco to El Calvario at 3:00am, in which participates more than 500 people. Saturday de Ramos: Vía crusis of Silence from the Church of San Francisco to El Calvario, at 5:00 am, in which only women participate. Sunday of Ramos: The Church commemorates the triumphal entry and passion of Jesus and the branches are blessed. Holy Monday, Holy Tuesday, Holy Wednesday and Holy Thursday: In the San Francisco Church, the Franciscan Friars pray the morning prayers before the Holy Mass at 6:30am. Holy Thursday: In every church, takes place the institution of the Eucharist at 4:00 or 5:00pm, and after the Mass, the Blessed Sacrament is exposed in a richly decorated altar. Easter Sunday: Churches celebrate Holy Mass celebrating the Resurrection of Jesus.